An honest, top-quality crêperie using organic Breton ingredients, plus a superb menu of craft ciders. 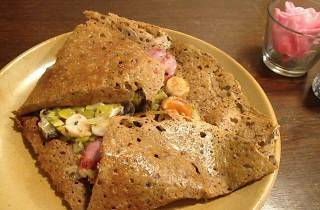 When you pick a crêperie for lunch, you generally won’t be expecting a gastronomic experience, but something simple and good quality that doesn’t break the bank. Which shouldn’t be so hard to find in Paris, but is. That’s why Mad Eo, an unpretentious little place in the 3rd arrondissement, is something of a blessing. From the crêpe batter to the garnishes via the ciders and beers, everything here is artisanal, organic, largely gluten-free, sourced in Brittany and completely home-made. The little dining room upstairs is done out in white paint and decorated wood, as simple and cheerful as the cooking. 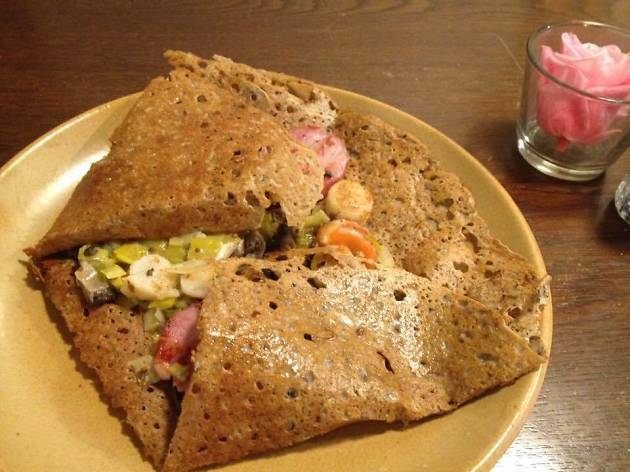 The crêpes run the gamut from basic (buckwheat with Le Ponclet butter) to more involved (the Scorf is a super sized version holding blood sausage, egg, Fourme d’Ambert cheese and nettle). It’s top quality stuff, though a small salad to lighten the plate would have been welcome. But we were thrilled by the genuine craft cider, picked from a list that treats the bottles as reverentially as wine (you can also buy it to take away). For dessert, there are high-quality classics – butter and sugar, cider confit, buckwheat honey. It’s enough to make you don a beret and Breton stripes. Exactly as described. What a lovely expeience. A must visit.